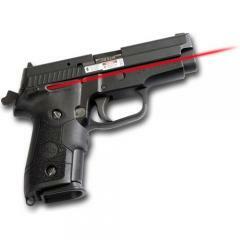 Crimson Trace LG-329, LG-429 Laser Grips for Sig Sauer P228 and P229 Series FREE SHIPPING! Improve accuracy and shooting time with the Laser Grip for Sig Sauer P228 and P229 series from Crimson Trace. Featuring the latest in micro-technology and the most powerful laser allowed by law, the optic upgrade is a must-have for tactical and law enforcement professionals. The sight utilizes a rubberized, over-molded backstrap and installs with only a few screws. The laser is conveniently located on the side of pistols, ensuring an accurate target picture without compromising the original iron sights, grip or handling of the pistol. The rear activation switch is located on the back of the handle and automatically turns on upon gripping the weapon. With Crimson Trace's signature Instinctive Activation control, the laser allows for instant target acquisition the second the firearm is drawn, delivering an impressive .5-inch dot factory-sighted at 50-feet. ©2002-2019 CopsPlus.com: Crimson Trace LG-329, LG-429 Laser Grips for Sig Sauer P228 and P229 Series FREE SHIPPING!